Hypatia was the daughter of Theon of Alexandria who was a teacher of mathematics with the Museum of Alexandria in Egypt. A center of Greek intellectual and cultural life, the Museum included many independent schools and the great library of Alexandria. Hypatia studied with her father, and with many others including Plutarch the Younger. She herself taught at the Neoplatonist school of philosophy. She became the salaried director of this school in 400. She probably wrote on mathematics, astronomy and philosophy, including about the motions of the planets, about number theory and about conic sections. Hypatia, according to sources, corresponded with and hosted scholars from others cities. Synesius, Bishop of Ptolemais, was one of her correspondents and he visited her frequently. Hypatia was a popular lecturer, drawing students from many parts of the empire. From the little historical information about Hypatia that survives, it is surmised by some that she invented the plane astrolabe, the graduated brass hydrometer and the hydroscope, with Synesius of Greece, who was her student and later colleague. The evidence may also point to simply being able to construct those instruments. Hypatia is said to have dressed in the clothing of a scholar or teacher, rather than in women’s clothing. She moved about freely, driving her own chariot, contrary to the norm for women’s public behavior. She was credited by the surviving sources as having political influence in the city, especially with Orestes, the Roman governor of Alexandria. The story by Socrates Scholasticus written soon after Hypatia’s death and the version written by John of Nikiu of Egypt more than 200 years later disagree in considerable detail, although both were written by Christians. Both seem to be focused on justifying the expulsion of the Jews by Cyril, the Christian bishop, and on associating Orestes with Hypatia. In both, Hypatia’s death was a result of a conflict between the Orestes and Cyril, later made a saint of the church. According to Scholasticus, an order of Orestes to control Jewish celebrations met with approval by Christians, then to violence between the Christians and the Jews. The Christian-told stories make it clear that they blame the Jews for mass killing of Christians, leading to the banishment of the Jews of Alexandria by Cyril. Cyril accused Orestes of being a pagan, and a large group of monks who came to fight with Cyril, attacked Orestes. A monk who injured Orestes was arrested and tortured. John of Nikiu accuses Orestes of inflaming the Jews against the Christians, also telling a story of mass killing of Christians by Jews, followed by Cyril purging the Jews from Alexandria and converting the synagogues to churches. John’s version leaves out the part about a large group of monks coming to town and joining the Christian forces against the Jews and Orestes. Hypatia enters the story as someone associated with Orestes, and suspected by the angry Christians of advising Orestes not to reconcile with Cyril. In John of Nikiu’s account, Orestes was causing people to leave the church and follow Hypatia. He associated her with Satan, and accused her of converting people away from Christianity. Scholasticus credits Cyril’s preaching against Hypatia with inciting a mob led by fanatical Christian monks to attack Hypatia as she drove her chariot through Alexandria. They dragged her from her chariot, stripped her, killed her, stripped her flesh from her bones, scattered her body parts through the streets, and burned some remaining parts of her body in the library of Caesareum. John’s version of her death is also that a mob — for him justified because she “beguiled the people of the city and the prefect through her enchantments” — stripped her naked and dragged her through the city until she died. Hypatia’s students fled to Athens, where the study of mathematics flourished after that. The Neoplatonic school she headed continued in Alexandria until the Arabs invaded in 642. 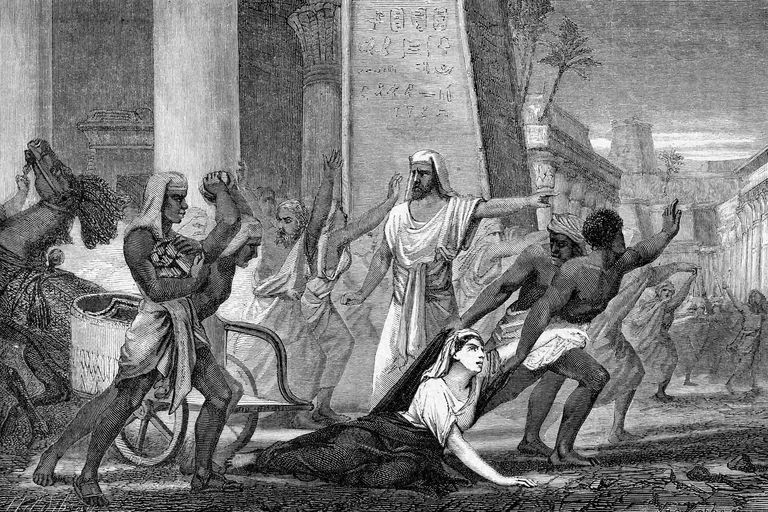 When the library of Alexandria was burned, the works of Hypatia were destroyed. That burning happened primarily in Roman times. We know her writings today through the works of others who quoted her — even if unfavorably — and a few letters written to her by contemporaries. Dzielska, Maria. Hypatia of Alexandria. 1995. Knorr, Wilbur Richard. Textual Studies in Ancient and Medieval Geometry. 1989. Nietupski, Nancy. “Hypatia: Mathematician, Astronomer, and Philosopher.” Alexandria 2. Kramer, Edna E. “Hypatia.” The Dictionary of Scientific Biography. Gillispie, Charles C. ed. 1970-1990. Mueller, Ian. “Hypatia (370?-415).” Women of Mathematics. Louise S. Grinstein and Paul J. Campbell, ed. 1987. Alic, Margaret. Hypatia’s Heritage: A History of Women in Science from Antiquity Through the Nineteenth Century. 1986. Next Next post: Religion and Politics, Which One Is Insane?